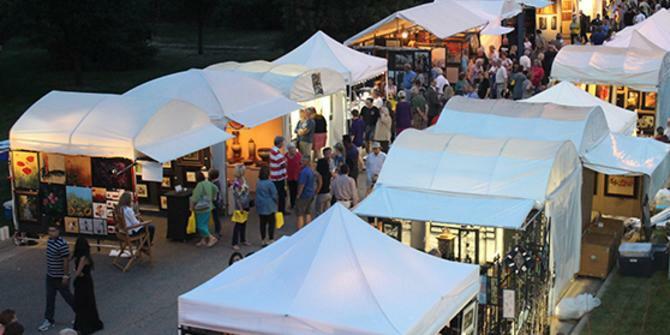 WICHITA, Kan. – The arrival of fall brings an artistic celebration back to Bradley Fair. Ninety-nine juried artists from across the country will display at the seventh annual Autumn & Art at Bradley Fair on Sept. 16-18, in Wichita. The event, put on by Wichita Festivals, Inc. (WFI), and presenting sponsor Fidelity Bank, is a chance for the community to experience a diverse array of creative talent. Organizers say it’s a unique offering that has grown in popularity and quality throughout the years, and is often thought of as the kickoff to fall in Wichita. The festival is fashioned after similar offerings in the Midwest like the St. Louis Art Fair and the Kansas City Plaza Art Fair. With offerings sprawled out along Bradley Fair Parkway, attendees are able to view and purchase art while enjoying food from the Culinary Pavilion including Jason’s Deli, Outback Steakhouse and On the Border. Live music from local favorites including Keefer Madness and Ryan Wyndham and performances by Wichita Shakespeare Co., Ballet Wichita and Opera Kansas will make it a multi-sensory affair. Artists will display in a variety of media, including ceramics, 2-D and 3-D mixed media, drawings, fibers, jewelry, painting, photography, sculpture and wood. There also will be an interactive children’s area and live art demonstrations. A Patron Party, featuring food from YaYa’s Euro Bistro, Newport Grill and Red Rock Canyon Grill, and specialty wine will offer a gourmet experience in a separated area Friday night during the festival’s opening. Tickets are $100 and help cover the cost of the weekend’s festivities. In addition to the food, there will be a silent auction and wine pull, live performances and photo booth fun by Lamphouse Photo Co. Though the party is only open to ticketholders, the remainder of the festival will be open to the public for free Friday evening, as well as Saturday and Sunday. For the first time in festival history, a bloody Mary bar, the Art of Bloody Marys will be held. “However you like your bloody Mary – mild, a little zesty or wow, that’s on fire – you can create your own masterpiece from the build-your-own bar,” said Jarvis. WFI said that attendance for the festival last year was 25,000 and they hope good weather will bring even more people out this year. Susie Santo, president & CEO of Visit Wichita, says Bradley Fair is an ideal locale for the annual arts festival. Artists apply to display at Autumn and Art at Bradley Fair and are selected by a panel of rotating jurors. Among this year’s pool is John D’ Angelo, Director of Arts and Cultural Services at the City of Wichita; glass artist Rollin Karg or Karg Art Glass Gallery; Sherry Leedy of Sherry Leedy Contemporary Art; Director of the Wichita Art Museum Patricia McDonnell; and Bob Workman, director of the Ulrich Museum of Art at Wichita State University. A different group of judges award prizes in each category. Jarvis says the festival contributes to promoting Wichita as an arts destination. Wichita Festivals, Inc. is a non-profit corporation with the purpose of creating diverse community celebrations within the Wichita community. The primary events produced by Wichita Festivals, Inc. are Riverfest (June 2 – June 10, 2017) and Autumn & Art at Bradley Fair (September 16th – 18th, 2016). For more information, contact Teri Mott at (316) 267-2817 or teri@wichitafestivals.com. Visit Wichita markets the greater Wichita area as a major convention and tourism destination, thereby enhancing the economic development of the city, county, region and state. Visit Wichita is led by president and CEO Susie Santo, and in 2015 travel and tourism contributed more than $1 billion in economic impact to the greater Wichita area.